Corpus Christi Watershed strives hard to follow the the injunctions of the Second Vatican Council, which has encouraged Catholics to use every possible means (especially that of modern technology) to bring the Gospel of Jesus Christ to the world. Watershed is always happy to report on advances in this area, and we’re honored to feature a Catholic priest who is helping to lead the way! This past week, Fr. James Fryar released an app on the App Store that makes it possible to view the daily Mass directly on your iPhone or iPod Touch. Friends of Corpus Christi Watershed will be familiar with Fr. Fryar, a member of the Priestly Fraternity of St. Peter, on account of the assistance his Reverence generously gave us with the Quis Non Amantem Project. iMass uses cutting technology to make the Mass accessible as never before. A year ago, Fr. 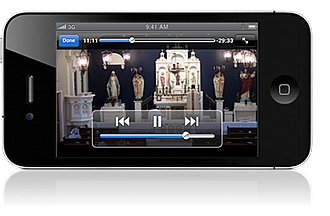 Fryar began a project in his parish to provide daily Mass live over the Internet. Livemass.net now has over 30,000 viewers each week from all over the world who can view the Mass live at 9:00 AM EST, or the recorded Mass at any time of the day. Viewers appreciate this form of uniting themselves to Holy Mass when it is not possible for them to attend a church near their homes, and the daily sermon gives them inspiration and something to think about as they continue their chores. iMass is now phase two of this project, and gives the Mass another level of accessibility, making it possible to view the Mass and sermon of the day anywhere, anytime. People from all over the world, from Finland to New Zealand, from the UK to the USA, can now unite themselves to the Mass of the day whenever and wherever they find the possibility. Obviously, this app is not a substitution for the traditional obligation to assist at Mass on Sundays and Holy Days. Still, missionaries and preachers from ages past have always insisted on uniting our hearts to the Universal Sacrifice of Holy Mass often throughout the day. Each Holy Mass is celebrated for the entire Church, and with over 350,000 Masses celebrated daily and four Elevations happening at every second, we should unite our prayers and works to all these Holy Masses each day. Modern technology is here used to help fulfill this traditional devotion, and iMass makes uniting ourselves to Holy Mass at any time of the day easier than ever before. So what will phase three of Fr Fryar’s project be? Nobody knows. For now, an app will be made for iPad (and possibly one for android devices). It is speculated that iMass version 2.0 will include a collection of daily sermons within the app.